Calcium Rich Foods - the best ones are generally not what most people think. The most calcium rich foods may not be what you think. In fact, there is one food that stands head and shoulders above the rest and it's not milk. Milk can cause inflammation for some people and pasteurization has destroyed most nutrients. There are more health benefits in eating dairy products that have been cultured or fermented like yogurt, kefir and cheeses. They contain more nutrients and are easier to digest. Men and women need at least 1,000 milligrams of calcium a day. Women past menopause need 1,500 milligrams a day while older men (51 plus) need 1,200. Teenagers need at least 1,300 mg. of calcium a day. It's not easy to absorb calcium from supplements so it makes sense to eat as many of these foods as you can. unsweetened almond milk 8 oz. 455 mg.
yogurt 8 oz. 300 mg.
salmon 3 oz. 300 mg.
cheese 1 oz. 200 mg.
ricotta cheese (part skim) 1/2 cup 330 mg.
broccoli 1 cup 100 mg.
beans 1/2 cup 70 mg.
stinging nettles infusion 8 oz. 500 mg.
As you can see from this list, unsweetened almond milk is the most calcium rich food you can consume. The other extraordinarily good news for us who are managing our weight is that 8 oz. of unsweetened chocolate Almond Breeze milk contains just 45 calories! You could have 3 glasses a day and get 1,365 mg. of calcium and only 135 calories. This makes it a superb snack food or to use as a base for a smoothie. There are other flavors like vanilla, plain and coconut and when you add fruit or a low glycemic sweetener to an almond milk smoothie you have a yummy smoothie. For a snack by itself I think the chocolate is best. It is filling enough to be satisfying when you have it with some fruit, a handful of raw nuts or a tablespoon of peanut butter on a whole grain cracker. A stinging nettles infusion of 8 oz. of tea is even a bit more calcium but it's less easy to consume since you need to make the infusion tea from the dried leaves. It's a great option for those who want to make the effort. Of course, any list of calcium rich foods needs to also include all dairy products, dark leafy greens, sardines, seafood, prunes, asparagus, cabbage, kale, sesame seeds and soybeans which also contain a good amount of calcium. What about calcium fortified foods? Why eat foods that have been "fortified" which means minerals (or vitamins) have been added when you can eat the whole food that contains it already? These are processed foods. The stinging nettle is known for it's high mineral content and especially high calcium and it makes our top foods list above. You can buy it dried from a natural foods market and make a nettle infusion which is one cup of nettles in a quart of boiling water. Let it steep over night in your refrigerator. This makes a very healthful drink full of phytochemicals and minerals including lots of calcium. Some call it nature's life elixer for it's anti-aging properties! In other cultures people eat only dairy products when these calcium rich foods are cultured or fermented. There are sound health reasons for this although before refrigeration was widely available, the reason these foods were fermented is that it was the only way to preserve them. The process of lacto-fermentation, as with cheese, yogurt, kefir, crème fraîche, cottage cheese, cream cheese and sour cream requires the lactic-acid-producing bacteria to digest and break down both milk sugar (lactose) and milk protein (casein.) This produces enough friendly bacteria to inactivate all the degenerating bacteria, a process that also renders the cultured dairy product much easier to digest. Culturing restores many of the enzymes destroyed during pasteurization and some vitamins increase during the fermentation. 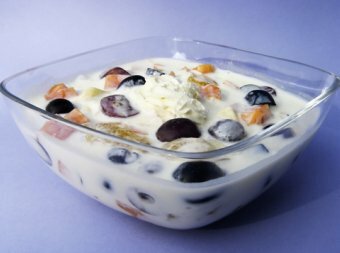 Many people have sensitivities to the casein and lactose in milk but can tolerate high quality yogurt and some cheeses which are high sources of calcium. Goat's milk cheese and cheese made from sheep's milk are far easier to digest than cow's milk and cheese. Another argument in favor of goat and sheep's milk cheeses is that these animals graze on grass and are raised naturally without hormones and antibiotics. If you love cow's milk look for organic cow's milk and it will be better yet if it comes from grass fed cows! Almond milk, in addition to having a high amount of calcium and vitamin D, is an excellent source of vitamin E. The soy isoflavones in soymilk are thought to help preserve bone mass in women. These unsweetened plant milks are low glycemic, low in calories and great choices for smoothies or shakes. Food sources are best for calcium and vitamin D but if you are a post menopausal woman you may still need to supplement. Look for calcium supplements that are in a food source for easier absorption, like bone meal, calcium carbonate, oyster shells or calcium citrate. Crème fraiche is low glycemic and a calcium rich food because it is a fermented cream. It's delicious when added in small amounts to soups. It's one of those small indulgences that makes a huge difference in flavor to the foods it's added to! The process of fermentation also restores many of the enzymes destroyed during pasteurization, enzymes that help us absorb calcium and other minerals. Regular consumption of fermented or cultured dairy products lowers cholesterol and protects against osteoporosis. We need the beneficial bacteria and lactic acid in our digestive tracts. These friendly bacteria are called probiotics and are beneficial in all sorts of ways. They prevent the overgrowth of yeast and other pathogens and synthesize vitamin K. They protect us against infectious diseases. Calcium rich foods are low glycemic as long as they have no sugar or high glycemic additives added. They are often an excellent source of protein and some healthy fats. Shakes or smoothies are great, healthy choices for calcium rich foods and can actually help you lose fat faster if you try replacing one meal a day. Make one meal, preferably dinner, a low glycemic, low fat smoothie or shake with some fresh or frozen fruit and you will see the fat disappear! For more articles on foods that lower blood sugar and how to finally lose fat permanently, click on the links below. Here are the foods with the essential fatty acids to put in your salads for good nutrition and to help you burn fat. Return from Calcium Rich Foods to Foods That Lower Blood Sugar. Return from Calcium Rich Foods to Lifetime Fat Loss home page.